The word “quit” isn’t in her dictionary. “I’ve auditioned for drum major every year I’ve been here. 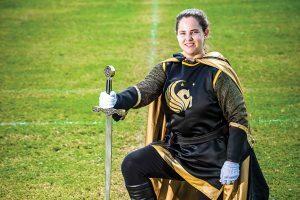 After each audition I would go to the directors and say, ‘What can I do to make myself better?’ Then I would implement those things into being a marcher or a section leader.” Her persistence paid off beginning in the 2017-2018 school year. Read the full article on orlandomagazine.com!